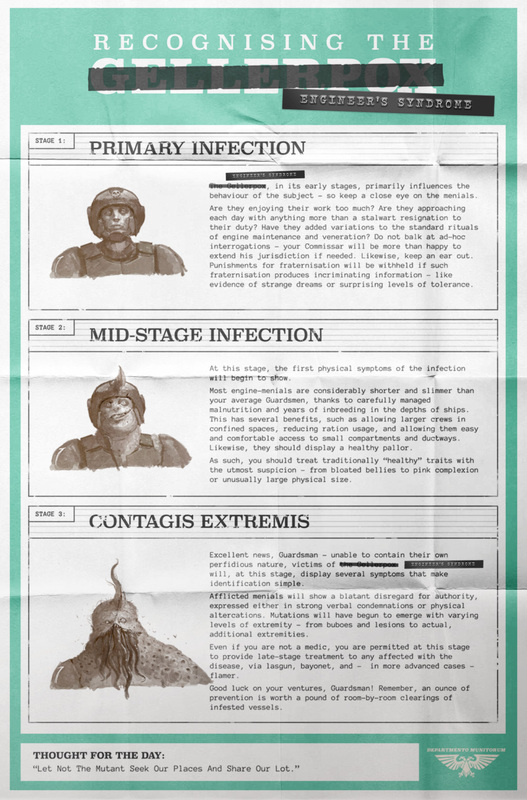 Reports of a new kind of contagion have come to our attention. Due to unsanitary conditions in engine rooms,* mutation and infection have risen to unacceptable levels on several Imperial vessels. While this infection is of no meaningful consequence to you, with your help, we will be able to stamp it out once and for all. Indeed, such activities should provide an excellent means of exercise during warp-travel. We have produced the following pamphlet to assist you in your endeavours. * Rumours that the disease is transmitted through the Geller field generators of ships have been exposed as preposterous misinformation. We are reliably informed by the Adeptus Mechanicus that the penetration of Geller fields by warp entities is absolutely impossible – all Guardsmen claiming the contrary will be flogged for insolence. Next Post Join the Basilisk Corps! Previous Post Working for Rogue Traders – Myths Dispelled!